The same script, when in the hands of different comic artists, are interpreted differently. With Working methods, author John Lowe has invited artists to interpret 3 scripts in this book, with an Q&A interview to look at their creative process. The artists are Mark Schultz, Tim Levins, Jim Mahfood, Scott Hampton, Kelsey Shannon, Chris Brunner, Sean Murphy and Pat Quinn. The artists talk about how they do compositions with respect to the script, finding and building reference materials, penciling, inking, lettering, and sometimes a little bit about their career in drawing. There's always something interesting to read about each artist. Such as Scott Hampton preference for printed reference over Internet reference because of resolution differences (but hey, there are lots of high res stuff out there today). This book is recommended for comic artists looking to refine their storytelling techniques or searching for inspiration. Professional comic artists interpret scripts every day as they successfully transform the written word into the visual form. However, rarely do we get to examine the process that is unique to each artist. Unlike any other "how-to" book, Working Methods puts the minds of comic artists under the microscope, highlighting the intricacies of the creative process step by step. For this book, three short scripts are each interpreted in different ways by professional comic artists to illustrate the varied ways in which they "see" and "solve" the problem of making a script succeed in comic form. 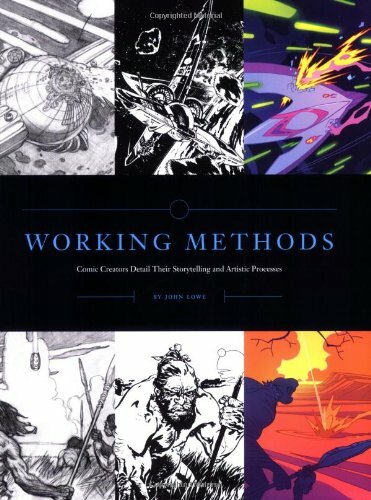 Working Methods documents the creative and technical choices Mark Schultz, Tim Levins, Jim Mahfood, Scott Hampton, Kelsey Shannon, Chris Brunner, Sean Murphy and Pat Quinn make as they tell a story, thus allowing comic fans, artists, instructors, and students into a world rarely explored. Hundreds of illustrated examples document the artists' processes, and interviews clarify their individual approaches regarding storytelling and layout choices. In Working Methods, the exercise may be simple, but the results are profoundly complex.